By Conan (now King of Aquilonia ) comes news of his ally , the ruler of Ophir Amalrusa . He reports that Kofskie troops raid the eastern provinces of Ophir and ask for help in dealing with them. Saying that if Conan will arrive with a thousand knights, is markedly strengthen the spirit of Ophir army. Conan of kindness leads Knights to five times more ... and finds out that fell into the trap . It turned out that his so-called ally, has teamed up with his old enemy Strabonusom Kofskim . Two powerful army against just five thousand knights of Aquilonia . 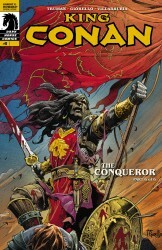 But Conan recalled : "And yet feared. Against afraid ... five thousand - two armies ! Afraid ... "